I was a bit giddy when I found out that I had been chosen to receive some books to review on my blog. There is nothing I love more than a good book and am always on the lookout for new ones. 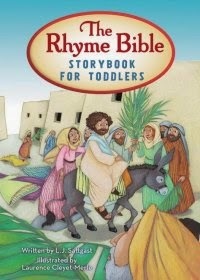 "The Rhyme Bible Storybook for Toddlers" was the perfect first review since part of our nightly routine is reading a Bible story before going to bed. The kids would get to hear the rhyming version of some of their favorite stories. When the box arrived in the mail EJ immediately had me read the Bible. I soon realized that this Bible is geared more toward a two year old than a four year old but I guess that is the definition of toddler. Her little brother enjoyed me reading it to him and I noticed that she stuck around to hear the stories. Each is short, a couple pages long, and gives a nice overview of the story. The rhymes flow along smoothly and are pleasant to the ear. The illustrations catch the little ones attention with their bright and lively images. CJ was excited to find the Easter story in the Bible as we had just celebrated that special weekend. Thomas Nelson provided a free copy of this book in exchange for me review which I freely give.